Since before the start of 2018, we have been relying on our advanced predictive modeling systems, technical analysis and our understanding of the capital markets to help our members take advantage of the incredible price swings in 2018. For those that have been following our calls, we’ve pretty much nailed every market turn over the past 5+ months perfectly and have been able to call many of the tops and bottoms in the markets two to three weeks (or more) in advance. Honestly, do you know of any other research firm that can call marker reversals nearly a month in advance and be correct in timing it? As of the beginning of May 2018, we’ve made our best predictive modeling tools a “Members Only” feature that will help our members secure greater success and see where the markets are moving weeks or months in advance of the move. Without giving away “Members Only” details, here is what we can share with you today. These charts of the SPY and Transportation index should help to clear up any confusion with direction and potential in the markets for most of you. Far too many people have been concerned with the global markets while thinking these concerns could negatively result in the US markets contracting. Our opinion is a bit different than many other analysts. We believe capital will come rushing into the US markets if weakness or concern continues in foreign/emerging markets. We believe these concerns will spark a “capital migration” into the US where it is likely that Equities and Commodities continue to rally as many foreign markets continue to weaken. Capital (CASH) is always searching for the best returns and will source the safest locations for ROI. 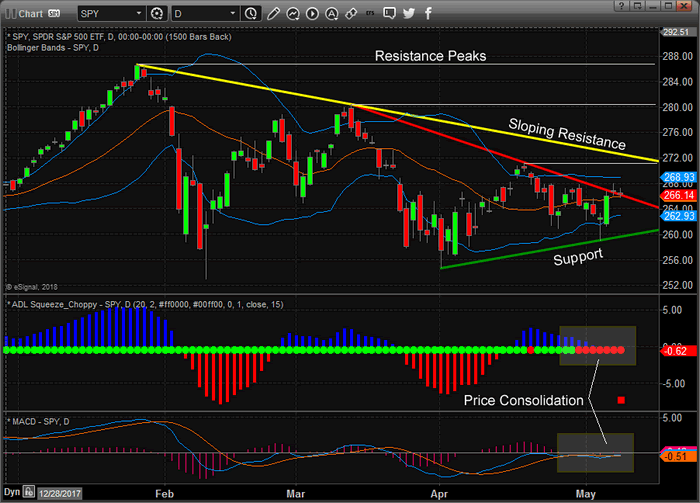 Take a look at this Daily SPY chart. It clearly shows the sloping resistance and support channels that are containing price over the past few months. Additionally, above the current price you can see horizontal PEAK resistance levels that should be considered upside targets and DUAL resistance levels (Red & Yellow) that are currently holding price from rallying upward. If you take a look at the lower indicators (ADL Squeeze and the MACD), you will see that price is very narrowly congested while recent support is evident with “higher low points” in price. 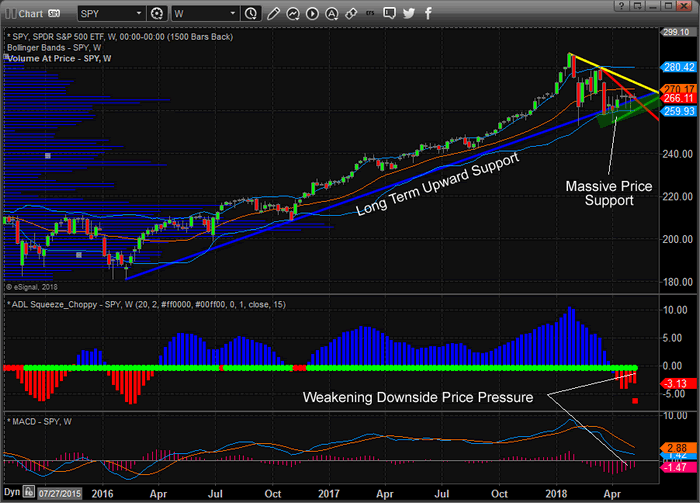 A broader look at the SPY Weekly chart shows a similar perspective over the past 3 months of price action, yet we can clearly see the Long-Term Upward Support channel as well as the Massive Price Support “block” that is near the right side of the chart. Again, the lower indicators are showing a weakening bearish price trend that coincides with technical price patterns illustrating price support is holding up well. The only thing holding this market back right now is the US Dollar and fear that any global market crisis could hinder the upside potential. Think about it, the US economy is still fairly strong and unless something derails it in a massive form, we don’t believe the downside risks are a concern at the moment. We believe that global capital will be moving into the US equity market faster than ever as a gradual weakness (“cold”) takes hold of many foreign and emerging markets. We believe the upside potential at this point in the market is the most likely outcome and we are trying to illustrate how we believe the markets will react over the next few weeks. Lastly, lets take a look at the Weekly Transportation Index. The fact is that all of these charts are similar in structure and form. It is almost like the markets are screaming at us and telling us what will happen next. Yet so many analysts are still fearful of downside pressures and predicting a top formation that will prompt a downside move. 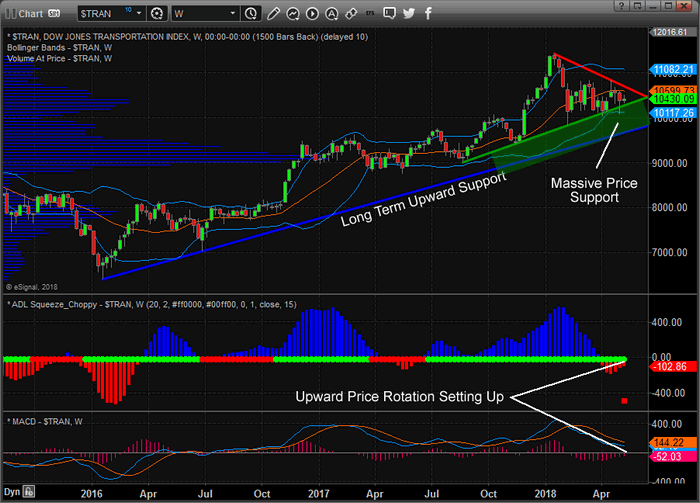 We believe the support levels we are showing on our chart would have to become threatened or breached before any downside move potential has any real chance. We also believe that price has been indicative of an upside reversal pattern within this extended Pennant/Flag setup. Yes, there was reason for some concern back in February, when the market volatility skyrocketed and the initial price drop frightened pretty much everyone. But our belief is that the recent price patterns, support and indicators and our advanced predictive modeling systems have shown us a different picture completely. We just don’t see it happening. We don’t believe the markets have much downside potential at this point in time and we have identified multiple unique trades that we have alerted to our members to take advantage of the future price swings. If only you knew what our predictive modeling systems were telling us. If only you knew what our adaptive Fibonacci price modeling system was telling us. If only you knew what our adaptive cycle analysis system was showing us. You would probably be doing much of the same things we, and our members, are doing right now. We’ve tried to give you a hint in regards to what our advanced technology is showing us and we want to remind you that we called this market bottom over three weeks ago. As long as these support levels hold and nothing dramatic derails the US economy and expectations, we believe the opportunity is for an upside price breakout that may drive prices to new all-time highs. Our members are uniquely positioned and taking advantage of this move already. You owe it to yourself to visit www.TheTechnicalTraders.com to see how we can help you stay ahead of the markets and profit from these types of price swings. Our latest trade resulted in nearly 9% profits in just a few days. As a commitment to our members, we save the very best for “Members Only” with our proprietary adaptive price modeling systems that can show us what price will likely be doing days and months in advance. We urge you to becoming a member and share in the success we deliver for all of our valued subscribers. Besides, your subscription helps support the development and research team that brings you all of these tools and technology.